"This simple compote is a great accompaniment to roasted lamb or beef. We live in Flathead cherry country so that's what I use, but any sweet dark cherry will work. 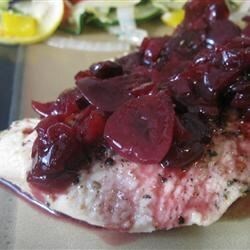 If using frozen cherries, it usually isn't necessary to add the water." Heat the cherries, sugar, rosemary, and water in a saucepan over high heat. Bring to a boil, then reduce heat to medium-low. Cover and simmer until cherries are tender and sauce is thickened, about 15 minutes. Remove from heat and stir in vinegar. Season with salt and pepper. Serve warm or cold. Served for husband's 45th birthday dinner. Tasty and different. Served with Roasted Lamb with Root Vegetables and Strawberry Blue Cheese Salad. Ann says 'Give this a 10'. I love, love, love Flathead cherries! Had a summer job sorting them as a teenager. This compote is delicious! !